When stuck between a rock and a hard place, what is the right course? The tiny island of Cyprus is forced to choose the best of only bad options. After years of over zealous banking leading to an oversized financial sector, Cyprus’ economy has finally snapped. Continuing the trend of failing European Union countries, Cyprus seems to be the next casualty after Greece. To avoid a possible countrywide bankruptcy, President Nicos Anastasiades agreed to extreme austerity measures to forestall an economic meltdown. Cyprus has agreed to close down Cyprus Popular, the country’s second largest bank, and freeze all accounts over 100,000 euros to pay off part of the country’s ever-increasing debt. President Anastasiades described the agreement as “the best that we could achieve.” For now, all banks in Cyprus remain closed until further notice and ATM withdrawals are limited to only 100€ a day, despite the President’s adamant affirmations that it is only a “very temporary measure that will gradually be relaxed.” It is estimated that withholding people’s personal funds will raise 4.2 billion euros of the 5.8 billion euros necessary for the bailout, but losses for uninsured depositors are expected to reach as high as thirty percent. Despite the Russian government’s outward endorsement of the plan, the Russian people are calling it “unjust, unprofessional, and dangerous.” In recent years, Cyprus has functioned as a popular offshore account for Russians. Russia showed its appreciation to the Cypriot government for being a holding place for its money by loaning it 2.5 billion euros in 2011 during a previous financial crisis. Now, Russians are starting to feel the heat about where they park their money, and they want out. In the midst of panic, Russia is demanding personal financial information about Russian depositors in Cyprus in exchange for more Russian financial support. However, Cyprus was unable to accept this condition and instead opted for a 9.9% tax on accounts over 100,000 euros instead of on all accounts. Such a levy has a “certain logic; Russians were the greatest beneficiary of the Cypriot banking system, therefore, they should be the ones who pay for the bulk of the bailout through the new tax.” Even though Cyprus has been receiving financial support from Russia, it appears that it will pursue a European solution without deferring to Russia. 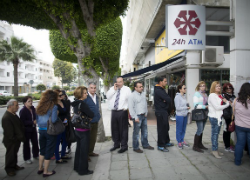 The re-opening of Cyprus’s banks on March 28th is only a small first step back back toward normalcy. Residents will still only be able to withdraw 300 euros from ATMs – an increase of 200 euros from the previous 100 euro limit. Other limits on credit and debit charges will remain in place and banks will not cash checks. As one banking official reports, “There is no way these will only last seven days. These are permanent controls until the economy recovers.” Decisions have already been made to fire the chief executive and the rest of the board of Cyprus’s largest bank, the Bank of Cyprus, which expects losses averaging around forty percent. In the midst of this financial chaos, demonstrations ensue, as many workers realize their jobs are lost and wages cannot possibly be paid. Cyprus is in a difficult position with seemingly no high ground. If it continues down its current path, Cyprus is setting a dangerous precedent for governments that believe withholding people’s own money is a viable option. The government is there to take care of its people; the people are not there to bail out the government. The government also needs to remember who it is protecting. The Cypriot government is there for the Cypriots, not the Russians. Resorting to blackmail and voluntarily handing out the private financial information of its depositors should never be a realistic option. So far, the Cypriot government has stood firm on this belief, but who knows how long the island nation can hold out against the all-mighty Angela Merkel or Vladimir Putin.